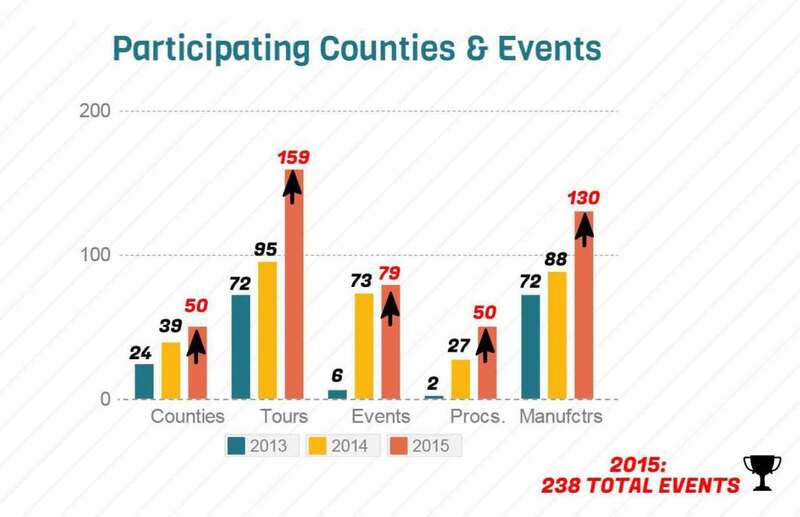 Official figures for 2015 MFG Day/Month are out and with that we are tooting our horns. For the third time in a row (past three consecutive years), Florida ranks Number 1 in the NATION for hosting MFG Day tours and events. 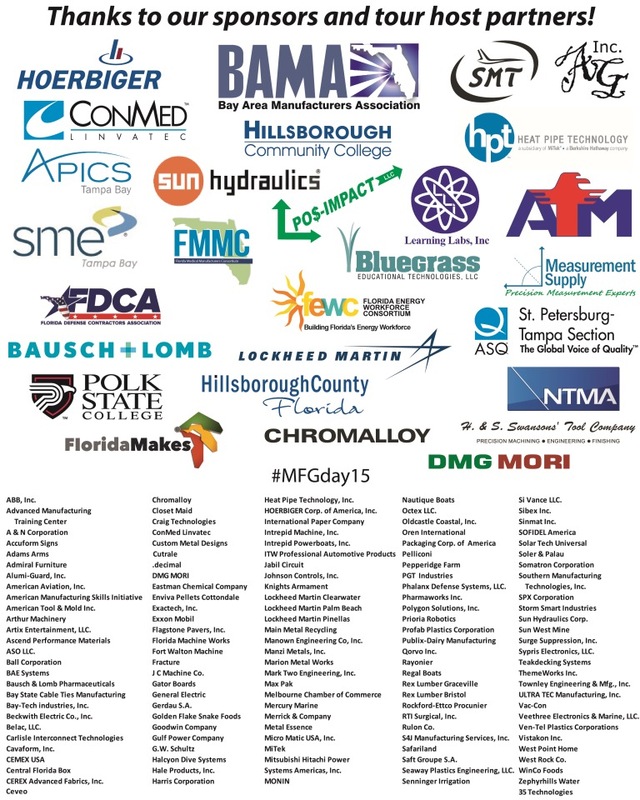 2015 was another banner year for Florida, as FLATE and its network of statewide partners worked cohesively to organize and host 238 manufacturing day/month events across Florida. 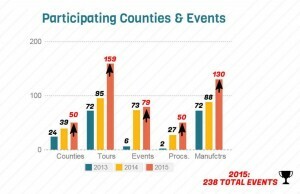 Since the conclusion of 2015 MFG Day/Month, FLATE has been working on compiling statewide data that provides an in-depth snapshot of the tours and events and the impact it had on all participants. 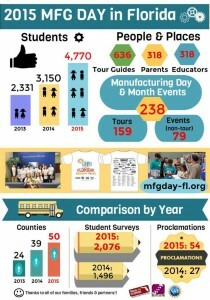 Let’s look at some of the impressive stats and figures from 2015 MFG Day/Month which once again placed Florida as the LEADING STATE IN THE NATION to host manufacturing day tours and events. Out of the 238 events, 159 comprised of industry tours; 79 were non industry tours and events like open houses, career fairs, movie screenings etc. 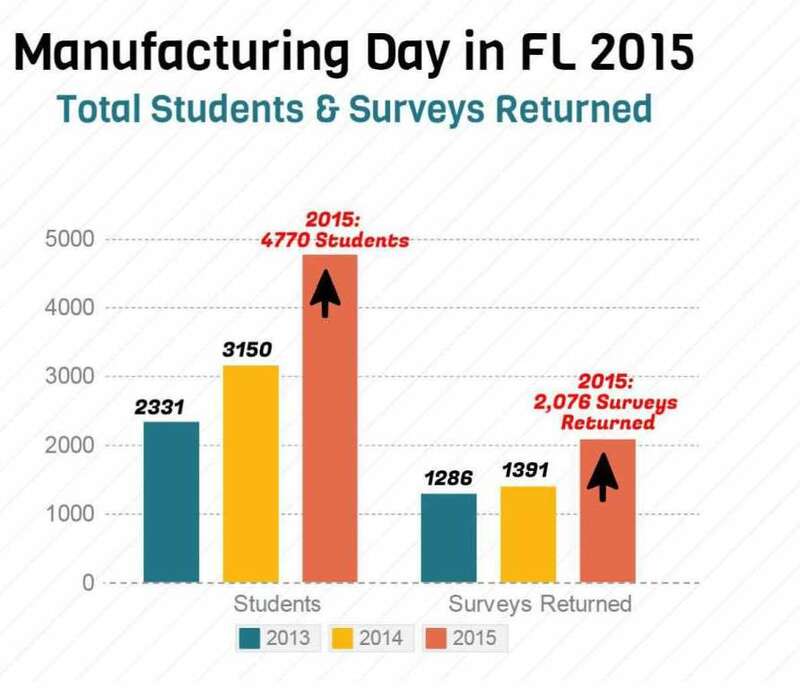 The number of students participating in a “Made in Florida” industry tour rose to 4,770. This increase in participation reflects a dominating trend for the last two years with 2,331 students in 2013, and 3,150 students going on industry tours for 2014 MFG Day/Month. Here in the Tampa Bay area which included Hillsborough & Pinellas Counties, more than 660 students and 88 teachers and parents participated in a Made in Florida industry tour. In Pinellas County, 390 students and 52 teachers and parents toured 13 industry sites across the county. Statewide the overall number of educators, parents (chaperones) and tour hosts participation saw a sharp increase. The number of tour hosts across the state witnessed an all-time high at 636 in 2015 compared to 88 last year and 72 in 2013. The number of educators accompanying students on a tour almost doubled to 318 (compared to 174 in 2014; 110 in 2013); the number of parents increased more than double from 113 last year to 318 in 2015. 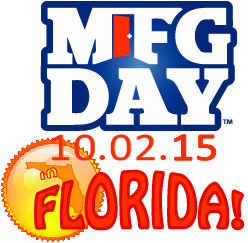 Additionally, there were MFG Day/Month events in 50 counties across Florida (compared to 39 last year). The number of county and city proclamations marking Oct. 2 as MFG Day and October as MFG Month also doubled from 27 in 2014 to 54 proclamations in 2015. 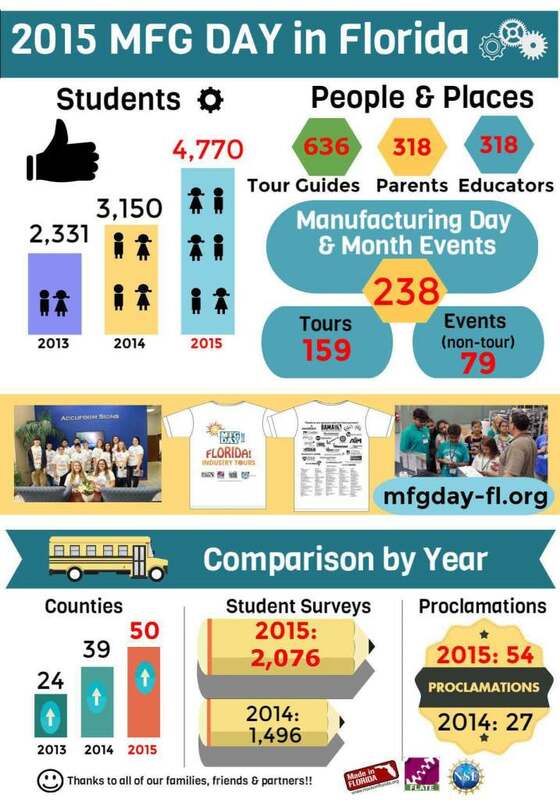 The number of educators going on a MFG Day/Month and/or Made in Florida industry tour almost doubled from 174 to 318. Number of parents nearly tripled from 113 last year to 318 this year, and tour guides from 264 to 636 in 2015. A defining component of MFG Day/Month, one that is almost exclusive to Florida, is the effort to survey industry tour participants across the state. 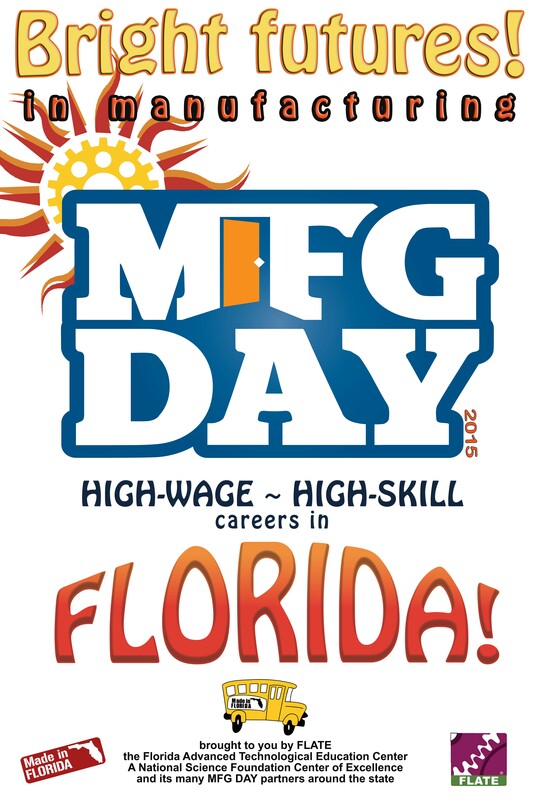 Since the inception of MFG Day/Month, FLATE has spearheaded and lead this initiative to survey statewide industry hosts, educators, tour guides and students participating in the Made in Florida industry tours. 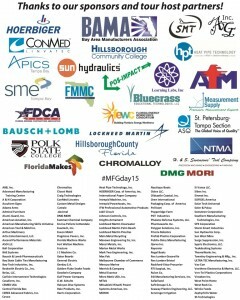 This effort, while time consuming and tedious, has not only helped FLATE define and streamline its outreach efforts to educate students, teachers and community at large about the role of manufacturing in the local/state economy, but has also given deeper insight to regional manufacturers, educators and manufacturers associations across Florida in developing tools for a customized outreach strategy in their region. Following up on this successful model that FLATE has established over the years in Florida, FLATE surveyed all participating students. Of the 4,770 students that participated in a MFG Day and/or Made in Florida industry tour, FLATE received 2,076 student surveys from across the state. Based on the tabulated the surveys, nearly 98% of the students stated the tours helped them learn about technologies used in advanced manufacturing industries and manufactured products. Approximately 96% of students agreed the tour gave them new information about careers in advanced manufacturing. Nearly 92% of the students surveyed also agreed that the tours helped them understand how STEM subjects are put to work in advanced manufacturing industries. In analyzing gender-based responses, there was approximately 116% increase in the number of girls compared to approximately 56% boys considering a career in advanced manufacturing before and after the tour. In terms of ethnicity, Hispanics topped the list at 718 students participating in the industry tours statewide, followed by 706 White and 356 Black students. Total male students (1452) outnumbered more than half the number of female students (623) which reiterates the need for more outreach to women and girls to be engaged in STEM and manufacturing. In addition to students, there was an overwhelming positive response from educators and parents who accompanied students on the industry tours for MFG Day. One hundred percent of teachers and parents agreed the tour helped them understand high-tech jobs and careers available in Florida. The same percentage also agreed that they would recommend the tour to other students, and would promote careers in advanced manufacturing for students. Approximately 96% of teachers and parents agreed they were able to see the applications of STEM in high-tech industries. Industry hosts were also among those surveyed by FLATE. Thirty three manufacturers who hosted the MFG Day “Made in Florida” industry tours responded to a short survey designed by FLATE to gauge industry hosts’ perceptions about the overall impact of the tours. An impressive 100% of industry hosts and guides who responded to FLATE’s survey stated that the tour was a good use of their company time and resources. One of the hosts stated that the tour was a good use of company time as it is an “investment into the future of technical education programs as well as teaching the next generation the value of American manufacturing.” Another also stated the tour was a good use of company resources and time as “it exposed area students to our industry. It gave them a better perspective about manufacturing environment, and us the opportunity to give back to the community in which we live, work and play.” Following the tours, 100% of the industry hosts also voiced their interest in setting up partnerships with local/regional schools.